The exotic architecture of the China Pavilion is very beautiful and ornate, standing back behind a pond full of vegetation. The China pavilion is host to a CircleVision movie about the country, and an exhibit called "Land of Many Faces" introduces visitors to the many ethnic groups of China. Dining opportunities include the full-service Nine Dragons, as well as the counter-service Lotus Blossom Cafe. Shops are full of exotic trinkets, and you don't want to miss the entertainment here, with young Chinese acrobats performing feats of incredible agility and flexibility. Location: The third national pavilion to the left as you enter World Showcase from Future World. China Pavilion Exhibit Space See the "Land of Many Faces" exhibit of some of Chinas many cultures. Dragon Legend Acrobats Young Chinese acrobats wow the crowd. Reflections of China A CircleVision 360 film showcasing the variety of China's geography and cultures. SI XIAN A troupe that performs authentic Chinese folkmusic. Joy of Tea A variety of teas, tea-based adult beverages and light snacks. Lotus Blossom Cafe Chinese fast food with some interesting desserts. Nine Dragons Restaurant A sampling of the many cuisines of China. Yong Feng Shangdian Department Store Chinese items of all types from toys to clothing to housewares. 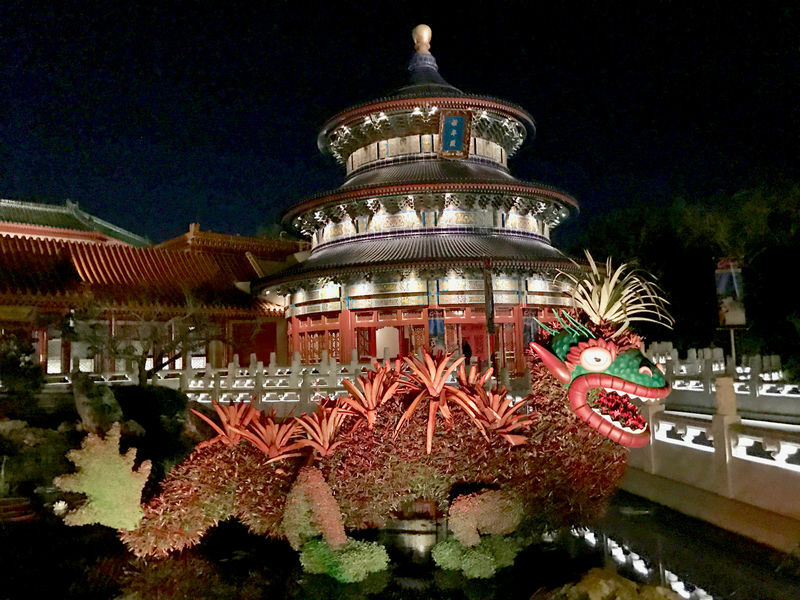 At this location: The China Pavilion has been part of Future World since it opened in 1982. The Land's History: The big change for the China Pavilion occured in 1985 when both the Lotus Blossom Cafe and Nine Dragons Restaurant opened. Before that there were no restaurants in the pavilion.